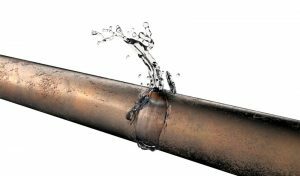 What to Do When You Have a Pinhole Leak | Doug Turner Plumbing CO. The first step to rectifying a problem is understanding it—so what is a pinhole leak? As the name might suggest, it’s a tiny leak in your piping, often smaller than a pinhole. It’s the result of something called “pitted corrosion”, which is when a copper pipe corrodes from the outside in. This type of corrosion is localized and continues to eat away at one specific area of your pipe until there’s a leak. A loss of water pressure in your home isn’t an inconvenience that should go ignored—this is a warning sign. When your water pressure drops, it’s a sign that you either have an advanced pinhole leak or a multitude of leaks in your home. A slow loss of pressure over time is a clear sign that your pinhole leak has grown in size. It’s best to call one of our professional plumbers as soon as you notice these problems with your system. If your pinhole leak has progressed over time to the point of lowering your water pressure, it’s likely that you’re suffering from water damage too. Unfortunately, homeowners don’t typically notice a pinhole leak until it’s corroded a significant amount of their pipe and caused water damage to the surrounding area. After all, how often are you really surveying your plumbing system unprompted? The subtle changes are going to go unnoticed. The longer you wait the worse the problem becomes, so call today! If you’re looking for a way to detect a pinhole leak when it’s still tiny, then pay attention to your water meter. Do you have a running water meter with no running water? Turn off all your appliances and check. If the meter runs while all your appliances are off, you’ve got a leak! At this stage, it’s likely that the leak is still small and can be repaired safely and efficiently. If you search “pinhole leak” online, you’ll get plenty of results for fixing pinhole leaks on your own, but we ensure you that this is a bad idea. When it comes to plumbing repair, a lot of DIY attempts are only quick fixes. When you hire a professional from our team, you’ll rest assured knowing that another plumbing problem isn’t looming on the horizon because of shoddy workmanship. If you think you have a pinhole leak, the only thing to do is call a trustworthy professional for repair services. If you need repair services for a pinhole leak in Bellaire, contact Doug Turner Plumbing CO. today to schedule an appointment.